Palm Spring — Ed Kopel, Architect, P.C. 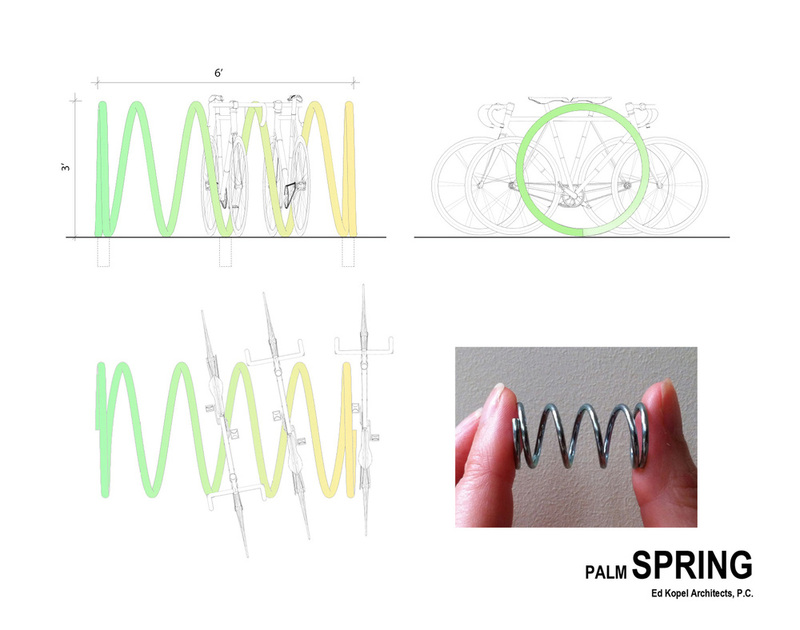 In the spring of 2013 my buddy from architecture school contacted me with news that the City of Palm Springs, where he lives, would be holding a competition for an urban bike rack. After sketching bike racks for a while, I stood back, and in my script-like scribbles, I noticed that a helical form laid on its side worked well as a bike rack. I started to look at industrial compression springs. The tongue-in-cheek irony of using a spring in Palm Springs made me chuckle. I started to consider Palm Springs in terms other than a beautiful desert oasis and I had to acknowledge that Palm Springs is a unique and vital American place with its own culture and architecture. I submitted my entry and was one of five artists chosen to fabricate their design. Though digital fabrication methods were considered, it turned out that the best way to fabricate the smooth continuous curve was with an old-fashioned, manually controlled pipe bender. Stainless steel studs were welded to the bottom of the coil for concealed mounting.